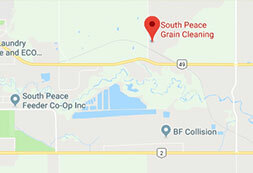 South Peace Grain has been offering B.C. grown, high quality, distillery wheat and rye to the province’s small batch distilleries since 2014. We are excited to offer a broad range of milled product consistencies which we package to your specifications and deliver to your location. We can have it shipped to anywhere in B.C. and Alberta and will work to ensure the best shipping rates possible. Samples are available upon request. Contact our knowledgeable staff by calling 250-782-7820 or emailing jocelyn@spgrain.ca to let us help you expand your business. We process Hard Red Winter Wheat and Fall Rye for our distillery customers on a year round basis. Malt variety barley is available by special request as are most other grain types. Each type of grain is only grown by a small selection of producers in the BC Peace Region. Six decades of seed processing experience for local farmers provides us with access to the highest quality grain possible. Our close ties with the farming community allow us to actively support small family owned businesses and sustainable farming practices. South Peace Grain is so pleased to be a part of this growing industry in B.C. We love the camaraderie and culture of inclusiveness that the small batch distilleries and breweries seem to embrace. Not to mention… we love the final products too! !